A unique memoir by Sir Michael Parkinson, reflecting on 100 of the most legendary encounters by the man who has met everyone who is someone. Sir Michael Parkinson occupies a unique place in the public consciousness. For many he is the chronicler of a generation. Through his onscreen work and his intelligent, thought provking journalism, he has introduced millions of people to the major names of sport of showbiz over the past five decades. 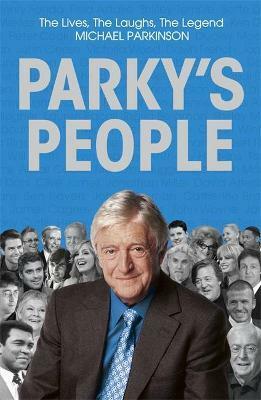 In Parky's People, Parkinson gives us an intimate insight into the lives of great celebrities from all around the world. Now an international celebrity himself, the man from a humble but colourful Yorkshire mining family who can tease out the secrets of even the most reticent star guest. Those featured include Muhammad Ali, David Attenborough, Judi Dench, David Beckham, and many, many more. Parkinson's distinguished career has involved working on highly acclaimed current affairs and film programmes. His wide interests and expertise include jazz, film, football and cricket. Witty and humourous, Parky's People makes the perfect gift. Born in Yorkshire, Michael Parkinson left school at sixteen with the ambition to play cricket for Yorkshire and England and to write about cricket for the Manchester Guardian. Although, he didn't manage to fulfil the first half of his ambition, he has since become one of the most successful journalists of his generation. He wrote a sports column for The Sunday Times for fifteen years and has also written for the Telegraph. He is also a legendary TV and radio presenter - his long-running chat show Parkinson was hugely popular for many years. © 2019 The Book Depository Ltd.UK.